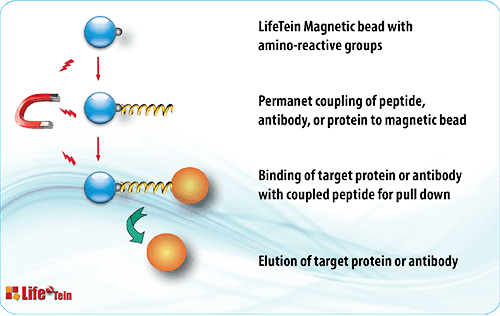 LifeTein provides special protein products including Alkali-tolerant Protein A, Protein G, streptavidin, human fibroblast growth factors, human vascular endothelial growth factor, human growth hormone, and human copper, zinc-superoxide dismutase. Protein A is derived from Staphylococcus aureus. Protein G is derived from a Streptococcus species. Both have binding sites for the Fc portion of mammalian IgG. Protein G has a higher affinity for rat, goat, sheep, and bovine IgG, as well as for mouse IgG1 and human IgG3. Protein A has a higher affinity for cat and guinea pig IgG. Protein G is recommended for most species, including mouse and rat. Protein A is recommended for cat and guinea pig. Neither is recommended for detection of IgA or IgM, for detection of Fab fragments, or for detection of avian IgG. Streptavidin is a tetrameric protein which binds very tightly to the small molecule, biotin. The binding constant for this interaction is very high and has made the streptavidin/biotin system the tool for intermolecular interactions. Fibroblast Growth Factor-basic (FGF-b) is a heparin binding growth factor which stimulates the proliferation of a wide variety of cells including mesenchymal, neuroectodermal and endothelial cells. LifeTein's recombinant Superoxide Dismutase belongs to Human Copper, Zinc-Superoxide Dismutase (rh-SOD1). Superoxide dismutase is a metalloenzyme. This enzyme binds to molecules of copper and zinc to break down toxic, charged oxygen molecules called superoxide radicals.